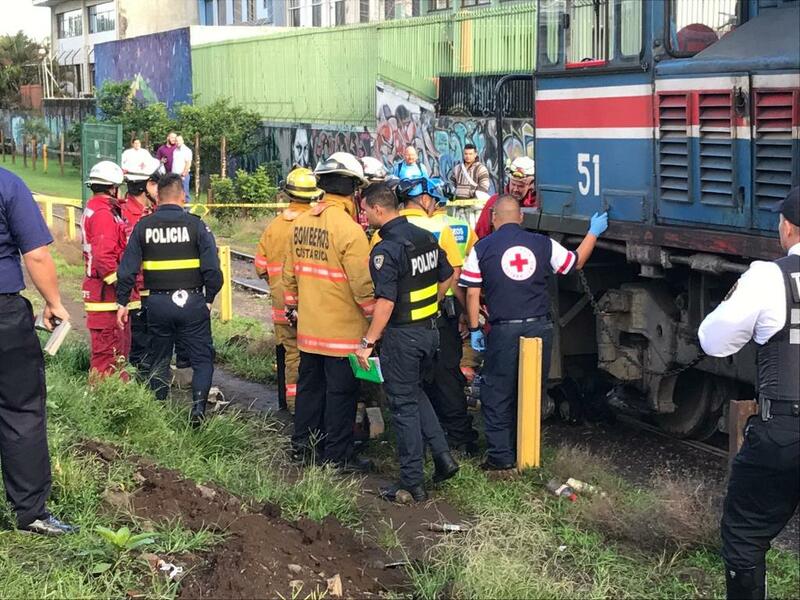 Between January 1 and this morning, six people have died in their encounters with the commuter train. Traffic in San Pedro, on the east side of San Jose, became a total nightmare – worse than the usual – due to a fatal accident with the commuter train. 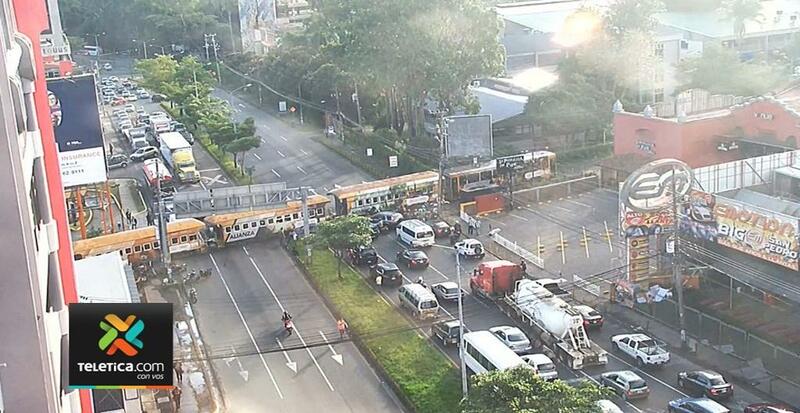 It was shortly after 6:00 am this Wednesday morning, for reasons yet unclear, a motorcyclist ends up under the wheels of the commuter train locomotive. Early reports say witnesses saw the motorcyclists trying to outrun the train, ending up encrusted and dragged the distance it took the train to come to a stop. 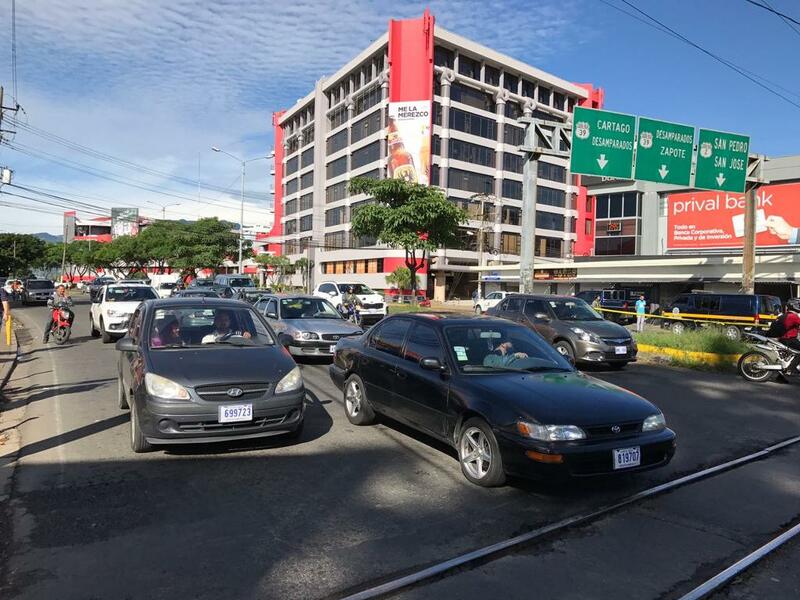 The incident occurred on the section of the Circunvalacion (ring road) from Guadalupe to Zapote that runs alongside Mall San Pedro, in front of Taco Bell, diagonal to the law faculty of the Universidad de Costa Rica (UCR). On this section of road, the train crosses the four plus lanes. There is no level crossing. The call to the 911 came at 6:16 am, Bomberos (Fire Department) and Cruz Roja (Red Cross) were on scene at 6:38 am, declaring the motorcyclist dead at the scene. As is the case, Organismo de Investigación Judicial (OIJ) officials are called to the scene to investigate and a judge has to give the order for the removal of the body, a process that usually takes hours to complete. At 7:45 am the road was re-opened to vehicular traffic. The motorcyclist, not yet identified, is the sixth person so far this year (one a month) to die in an encounter with the commuter train. In a Tweet, the Incofer (railway) announced the suspension of train service from the Atlantic Station to San Pedro, though the Cartago – UCR (San Pedro) service will continue normally. Editor’s comment: The Q does not usually report on such incidents, however, it is included today in our reports to emphasize the need to take extra care when approaching a train crossing. Although the commuter train runs only weekday mornings and afternoons, THE TRAIN CAN COME AT ANY TIME!